Flash photography is the nemesis of a large number of amateur photographers. We read about it, we study it and even watch you tube video on it but time and again when try and put our limited knowledge into practice we are reminded by our limited success how trickier a subject this can be. It was with this issue in mind Mid-Cheshire Camera Club (MCCC) decided to employ the services of our own home grown talent of Graham Quinn (grahamquinnphotography.co.uk). Graham (picture above) joined the club last year and is part of a generation of photographers that refer to themselves as being from the ‘old school’ – where photography was learnt the hard way with film and hand held light meters. Graham presented an excellent session based on the premise – ‘Single flash photography on a budget’. 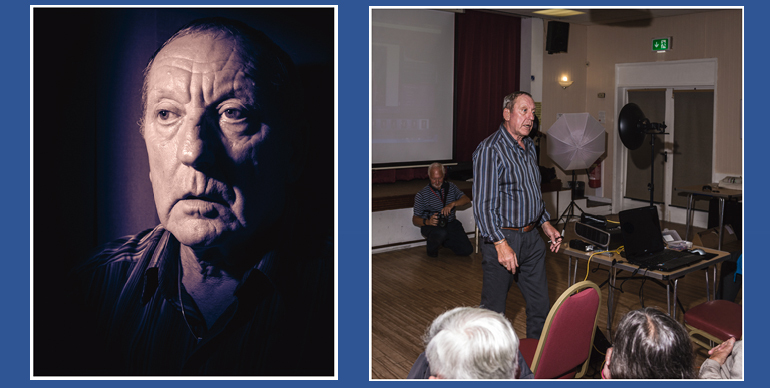 During the two-hour session he was able to dispel the myths of using a single flash to obtain good quality portrait images. Graham, accompanied by his daughter in law – Laura who was our model for the evening, informed us on the basic principles of equipment needed, general set up and finished the theory with how to identify the correct flash exposure in three test shots. In parts of the session Graham went into more detail showing us how to set up our flash using radio triggers and a vast number of light diffusers from shoot through umbrellas to soft-boxes, from honeycombs to snoots, eventually ending with the beauty dish. He taught us how to recognise types of light; soft and hard light - giving us tips as how to make our lighting softer just by placement of the flash creating a more pleasing portrait result. He talked about flash guns and their respective power outputs noting that a number of members did not have a flash and would not be confident in what to purchase. He discussed built in of some cameras helping us to understand their limitations but also providing us with new knowledge as to their usefulness in powering off camera flash or being used as a fill in flash. As this was a practical ‘bring your camera along’ type of event, Graham didn’t disappoint. After tea, he provided one to one advice and support to any member wanting to take images of Laura using his flash set up. Throughout the evening Graham fielded questions from a packed audience of 30 enthusiasts and was able to show his full range of knowledge. The members had a fantastic knowledge packed evening thanks to the efforts of Graham and Laura. I look forward to seeing the results of his presentation in the submissions for this year’s photographic competitions.